Topped with crispy onion rings, these burgers will make you feel like gathering around a campfire for sure! Sometimes I chop the bacon up into small pieces and mix it into the burgers like I did today, and sometime I don't, and I just crisp up the bacon strips and put them on top of the burgers. The chopped up version add's a wonderful flavor and texture to the burgers that is just incredible, but your guests won't always be able to tell it was bacon in the burger, they'll just know the flavor was fantastic, It's a fun twist on the burger, you may want to try! Here's a photo of my meat mixture with the bacon all diced up and ready mix in! Let's get those Cowboy Burgers on the grill! This burger has bacon embedded into the burger itself, along with bbq seasoning this burger has classic cowboy taste! 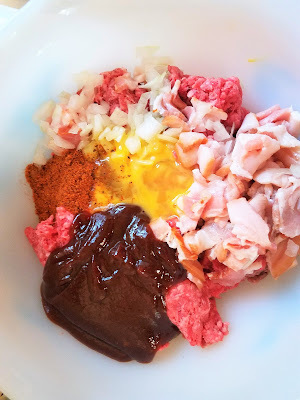 In mixing bowl mix together ground beef, diced bacon (if adding it in ) minced onion, bbq rub, egg, and bbq sauce. Form into 4 quarter lb. patties. Grill burgers on medium hot grill, about 5 min on each side, or until desired degree of doneness.Top with cheese before removing from grill.Place lettuce and tomato on bottom bun.Place burger on top lettuce/tomato bun.Top burger with bbq sauce, add in slices of bacon if you did not add them into the beef mix, and finish it off with french fried onions before placing on the top bun. Burgers on the grill are always one of the first summer meals we have. I love this version. Nothing better than bacon AND burgers. Yum!! Thanks for posting. The onions, the sauce, the flavors. This looks like one killer burgers. Love the idea of putting the bacon inside the burger! So much flavor. Your burgers look amazing! So much flavor in there, like the idea of BBQ sauce right in there. Jan, that sounds soooo good! I've never mixed the bacon with the meat, but I can just taste it now!